Gravity Flow version 2.5 is now available via auto-update and for download from the account area. This is a major release that includes support for the Gravity Forms Partial Entries Add-On (yes, abandoned cart emails), due date settings, workflow start and complete settings, an Update User step, Constant Contact integration plus security enhancements and bug fixes. We recommend that customers upgrade as soon as possible. Important: Gravity Flow 2.5 requires Gravity Forms 2.3 or higher. Gravity Flow now includes support for the Gravity Forms Partial Entries Add-on. When the workflow setting is enabled for Partial Entries the workflow will be processed when a partial entry is created. For example, you can design a workflow which sends a sequence of abandoned cart emails allowing users to resume the form from where they left off. This is achieved with a series of “Partial Entry Submission” steps. Further details in the documentation. Check out the abandoned cart emails demo! Gravity Flow 2.5 includes due date settings for the Approval and User Input steps. When an entry is overdue it will be highlighted in the inbox. The due date can also be displayed as a column on both Inbox and Status shortcodes with the due_date=”true” attribute. The new Workflow Start and Complete settings allow even greater control over the workflow. The Workflow Start settings provide a conditional logic setting for the entire workflow – if the conditional logic is not met then no workflow steps will be processed and the final status will be set immediately to complete. The Start settings also include a “Pending Message” setting which will display a special message to the form submitter when viewed via the status page. The settings also provide a way to define which fields are displayed to the form submitter while the workflow is in progress. 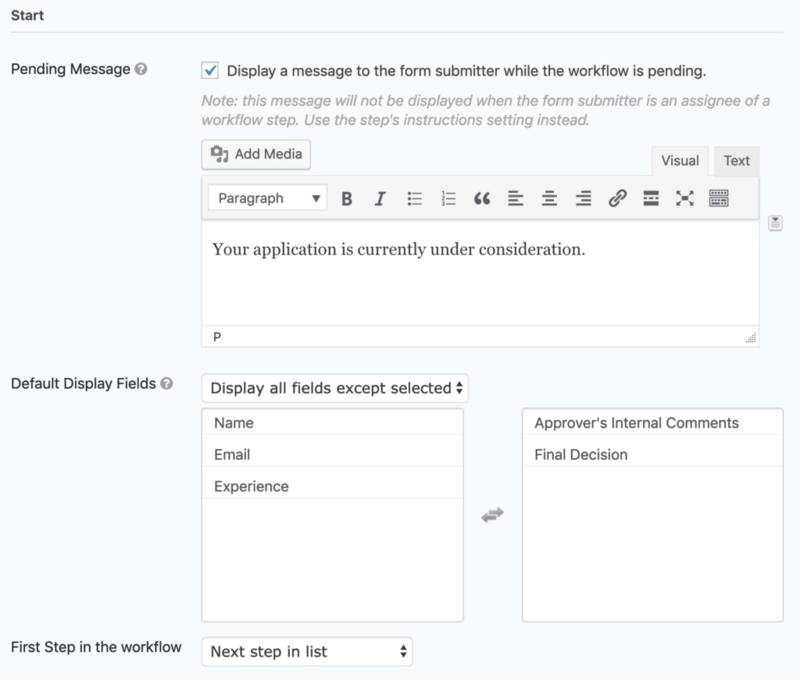 The Workflow Complete settings are similar to the Start settings: a “Complete Message” which is displayed to the form submitter when the workflow is complete and there is also a setting to define which fields are displayed. Further details about the Workflow Start and Complete settings in the docs. The Update User step is a very powerful step which allows user profiles to be updated as many times as necessary throughout the workflow. 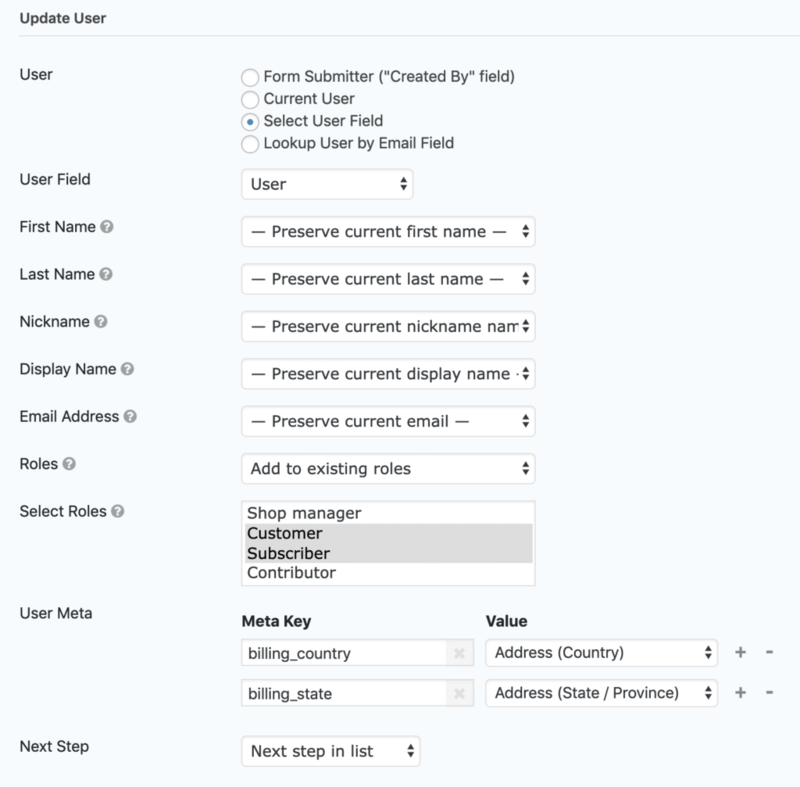 The Update User step can update the user profile of the form submitter (the created_by field), the current user (e.g. of a User Input step), the selected user in a User field or the account looked up using the value of an Email field. The following profile properties can be updated: First Name, Last Name, Nickname, Display Name, Email Address, Roles and Custom User meta. The Roles setting allows the roles to be replaced completely by a new set of roles or additional roles can be added to the user’s existing roles. Gravity Flow 2.5 now supports the Gravity Forms Constant Contact Add-On. Just select the Constant Contact feed you wish to trigger. Gravity Forms v2.5 is now even more secure with the addition of shortcode security settings on the Workflow->Settings page which allow greater control over the shortcode attributes. Added support for the Gravity Forms Partial Entries Add-On. Added the Update User step to update a user profile – requires the edit_users capability. Added link on entry detail page, shortcode only, to ‘Return to list’ which links user back to inbox / status page. Added shortcode attribute back_link (default: false) to identify if back link should be displayed on entry detail for entries loaded via shortcode. Added shortcode attribute back_link_text (default: “Return to list” translatable) to allow customization of text for back link on entry detail page. Added shortcode attribute back_link_url (default: null) to allow customization of back link on entry detail page. Added filter gravityflow_back_link_url_entry_detail to allow customization of back link on entry detail page. Added filter gravityflow_search_criteria_status to allow status page to filter on multiple field criteria. Added step setting type for due date with sub-options for delay/date/field selection and row highlighting for inbox. Added the due date settings to the approval and user input steps. Added inbox and status attribute due_date (false by default) to show due date column. Added shortcode security settings to the Workflow->Setting page. Fixed the workflows for GP Nested Forms child entries starting before some Gravity Perks extensions had updated the entries. Fixed an issue that prevented conditional routing from correctly matching date field conditions. Fixed an issue that assignee fields with placeholder text would have invalid blank selection options on user input steps. Fixed the outgoing webhook for steps with raw request body defined to have field merge tag values properly escaped. Fixed an issue with the outgoing webhook step where GET requests using connected apps do not include the authorization headers. Great work guys, some really useful features here.